I wish my camera was good enough quality to have the two top photos as separates as I've really been enjoying that kind of layout I think, but unfortunately I'll only be able to do that if I blog with sapphiresaysfashion or when I get to one day upgrade my camera, but for now this will have to do. Now I know I'm not the most fashion forward person as I've said many times before but honestly, this could be one of my favourite outfits at the moment. I got this tee when I went to Newquay not so long ago, my favourite thing to do when I go to Newquay is make sure I pick up a tee you can't get back at home and as I am a huge fan of surfing/skating (even though I can't actually do them, unless you count standing up on the board on a tiny wave for a few seconds or riding up and down my road on a board, then yeah) The material of the top is so comfy and it is earth positive, which means it's made with wind and solar energy so the manufacturing didn't harm the environment which is always a nice thought. I'm not usually a huge fan of slogan tees but this one is so simple and I love the font they've used and the logo in general, it really does give such a laid back feel to the top. In other news I'm moving to University in just 7 days and I couldn't be more excited and scared if I tried, I'll be moving away from everyone I know just like everyone else but there is something quite daunting about it. Although I've heard all the amazing stories that all freshers have so that definitely helps and I actually cannot wait to do my own food shopping (sad I know) and of course decorate my room and meet lots of new people so that helps with excitement and I can't wait to start working towards becoming a Primary teacher, things are about to get very exciting! 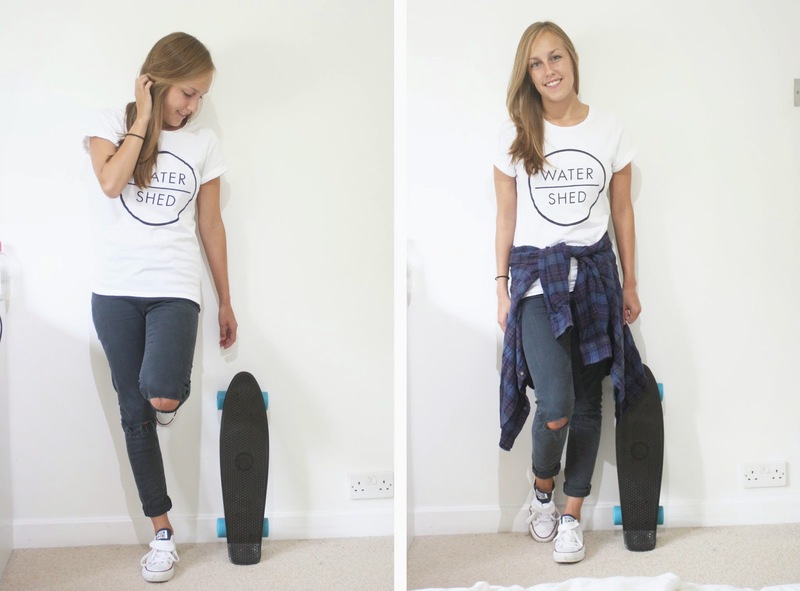 I didn't know you had a penny board! You must teach me tehe!